This photo of a mural is on the side of my house in Flagstaff, AZ. I am currently in a photography class at Northern Arizona University and I took this photo for our “Twilight” assignment. 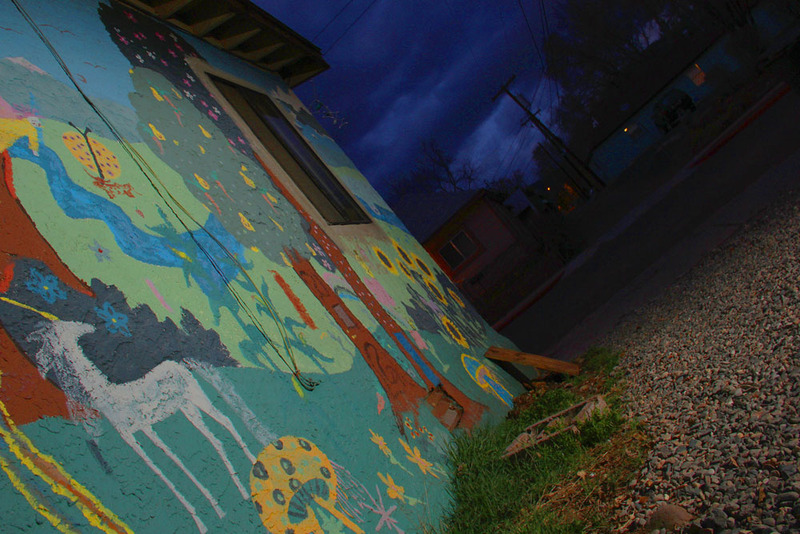 I have always wanted to capture this mural because I am graduating and leaving Flagstaff in one month and this house holds so many memories of mine. I have lived in this house for the last two years of my college career and made so many memories with so many friends that I would love to be able to fondly look back on. My cousin lived in this house when he attended Northern Arizona University and I moved in when he graduated and moved back home. My cousin and his friends created the mural on the side of the house with permission from the landlord during the first year they lived there. I miss my cousin very much and this mural reminds me of him every time that I see it. It impacted part of my life, I want to preserve it and I thought photography would be a great way to do just that. I did not want to make this a standard picture of the side of my house though. I wanted it to be interesting and unique. Noticing all of the color in the mural and the assignment having to do with an unusual color setting, twilight, I thought this may be a good opportunity to make this image. The mural, in my opinion, is funky, fun and bright with a personality of its own. So, I chose to tilt the camera on my tripod and attempt to make the picture itself different and unique as well. As for the technical side of this image, I shot it with a Canon EOS 60D camera at a focal length of 18mm, ISO 100, aperture f/16 with a shutter speed of 2.5 seconds. An off-camera flash was used with wireless triggers. I originally placed the camera on a tripod but that image seemed too boring for me. I decided to spice it up a tad by putting all of the legs of the tripod together and tilting it. I kept it on the tripod to steady it a little bit because of the long shutter speed. Now, just a little bit about me. I am currently a student at Northern Arizona University studying Communications Studies with a minor in Public Relations. I am graduating this coming May 2016 and will be moving back to my hometown of Seattle, WA. I originally dipped my toe in photography to fill college credits but ended up really enjoying the art and am now taking my third photography class in the past three semesters here at NAU. I had no idea all of the components that go into creating a single image and I feel privileged to have been able to just begin to scratch the surface into the world of photography. To read more about the Northern Arizona University “Behind the Image: Guest Blogger” project on our blog, please read the introduction at youcansleepwhenyouredead.com/wordpress/4th-annual-northern-arizona-university-behind-the-image-guest-blogger-project. Please take a minute to leave your thoughts and constructive comments in the Comment section below – Jacquelyn would love to hear from you!